The Institution for Social and Policy Studies (ISPS) at Yale University advances interdisciplinary research in the social sciences that aims to shape public policy and inform democratic deliberation. Where university centers tend to be inward looking, our community of students and scholars makes a point of not only contributing to academic discourse but also engaging directly with policymakers and participating in public debates. Through this work, we strive to both identify and elaborate particular areas of concern and, more broadly, to encourage reasoned policy debate and formulation at the state and national level. By supporting policy education, fellowship programs and extracurricular activities, we also develop future leaders who will themselves inform – and perhaps even join – the policymaking community in years to come, bringing with them the commitments to inquiry and scholarship that lie at the heart of ISPS. The ISPS network includes scholars and students from many departments in the Faculty of Arts and Sciences and from Yale’s graduate and professional schools as well as select experts from other institutions. The community is built around a range of programs; among other activities, we organize interdisciplinary faculty seminars, support research and publications, host faculty fellows and post-doctorate researchers, run fellowships for undergraduate and graduate students, convene scholars and practitioners, and sponsor an interdisciplinary undergraduate major, the Program in Ethics, Politics & Economics. We also support specialized study centers, the Policy Lab, the Center for the Study of American Politics (CSAP), ISPS Health Policy Center at Yale, and the Interdisciplinary Center for Bioethics. Recognizing that important social problems cannot be studied adequately by a single discipline, the Yale Corporation established the Institution for Social and Policy Studies in 1968 in order to stimulate interdisciplinary collaboration within the university. In our 50-year history, ISPS has produced research driven by faculty interests and expertise that breaks methodological and theoretical boundaries to illuminate new frontiers of knowledge. In recent years, ISPS has also developed an international reputation as a leader in a style of research known as field experimentation. This method involves the random assignment of various social interventions to individuals or institutions; it has been used to study the effects of tax policy on savings, of cost-sharing on utilization of health services, and of educational programs on academic achievement. The Bulletin of Yale University includes several issues devoted to ISPS (PDF). 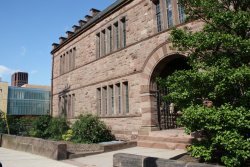 ISPS is centered in a large complex of three inter-connected buildings at 77 Prospect Street in the heart of Yale University, just a few blocks from downtown New Haven. Since 1968, the current building has housed and supported Yale faculty from social science departments and professional schools. In the summer of 1994, ISPS moved to its current site. The growing momentum of ISPS research and teaching activity has led to a major expansion in 2006. 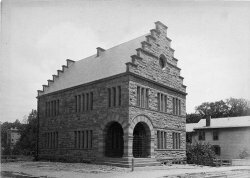 A little known fact is that the original building on 77 Prospect, built in 1884, was the “Old Hall” for the Wolf’s Head Society at Yale. For press inquiries, please contact Victoria Bilski.